Enjoying time as a family in the outdoors is a great way to have fun with your children this summer. Eating outdoors is especially fun for kids. And with a little planning, your family can take pleasure in eating healthy, kid-approved meals on your next picnic or camping trip. Keep the meal simple, easy to prepare and a snap to clean up. Finger foods are good options and kids love anything they can dip. Turkey or veggie wraps and roll ups are well accepted. A baggie full of carrot and celery sticks, cucumber and bell pepper slices, sugar snap peas and cherry tomatoes will go quickly if there's a dip to go with them. Small finger-sandwiches, chicken nuggets, cheese and crackers, melon balls, cookies, bottled water and juice boxes are also very popular. Freshly grilled corn-on-the-cob is delicious, messy, and fun to eat! 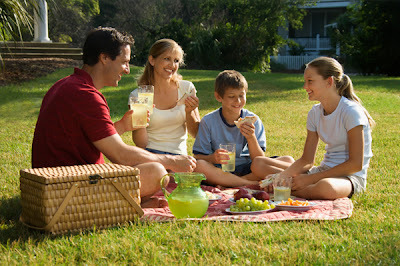 Tip: Involve the children in the picnic planning process. Depending on the child’s age, you can also have the kids help with grocery shopping, assembling the ingredients for the picnic or helping with the food prep. Kids love to pick their own food and assemble it on their own. Even young children can assist with stirring ingredients for a dip, washing fruits or vegetables or filling a baggie with snacks. When you involve children in the food selection and preparation process they'll be more likely to eat what is served.